has been named the “Best Historic Resort ” after being awarded the distinction at Historic Hotels of America’s Annual Awards Program. The Historic Hotels of America Annual Awards recognize and celebrate the finest historic hotels and hoteliers. The 2013 awards ceremony and gala took place at the historic Pfister Hotel, Milwaukee, November 21, where the final award winners were announced and presented awards. French Lick Resort, with its signature West Baden and French Lick Springs Hotels, has often been called “The Save of the Century.” Local residents teamed with the Historic Landmarks Foundation of Indiana and Indiana philanthropists and entrepreneurs, Bill and Gayle Cook, to restore the West Baden Springs Hotel, a National Historic Landmark, after an exterior wall had collapsed. One of the largest private historic restorations in the history of the United States, the $500 million restoration and development project also included the meticulous restoration of the French Lick Springs Hotel, development of the French Lick Casino, restoration of the Donald Ross Course, creation of the award-winning Pete Dye Course and upgrade of the Valley Links Course. 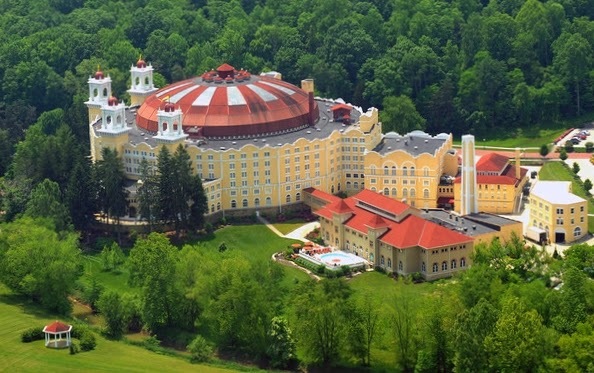 French Lick Resort is a $500 million historic restoration and casino development project that includes the West Baden Springs Hotel, French Lick Springs Hotel and the French Lick Casino. This premier resort and casino destination in Southern Indiana features 686 guest rooms and suites; a 51,000-square-foot, single-level casino; 63 holes of golf, including the fully restored 1917-designed Donald Ross Course at French Lick and the new, 18-hole Pete Dye Course at French Lick; two full-service spas with a combined 36 treatment rooms totaling 42,000 square feet; meeting and event space totaling 115,000 square feet (with an additional 56,000 square feet in development) and an array of dining and entertainment options. Visit FrenchLick.com. Historic Hotels of America is the official program of the National Trust for Historic Preservation for recognizing and celebrating the finest Historic Hotels. Historic Hotels of America was founded in 1989 by the National Trust for Historic Preservation with 32 charter members. In 2007, Preferred Hotel Group partnered with the National Trust for Historic Preservation to grow and enhance Historic Hotels of America. Historic Hotels of America has more than 240 historic hotels. These historic hotels have all faithfully maintained their authenticity, sense of place, and architectural integrity in the United States of America, including the U.S. Virgin Islands and Puerto Rico. To be nominated and selected for membership, a hotel must be at least 50 years old, listed in or eligible for listing in the National Register of Historic Places or recognized as having historic significance. Visit HistoricHotels.org. Great list! Now I just need to find one for NYC since I will be staying at the Tribeca hotel soon.